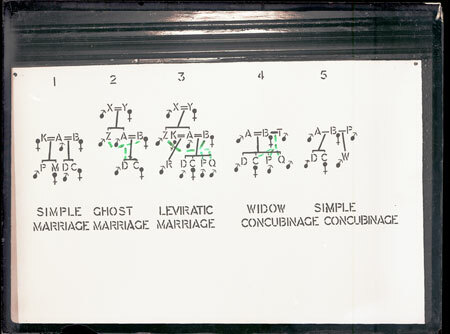 A diagram of four types of Nuer marriage stenciled by Evans-Pritchard onto a large sheet of paper and pinned to the interior wall of a building, almost certainly in Oxford, and probably in the late 1930s when he was Research Lecturer in African Sociology. The dotted lines have been added by Evans-Pritchard onto the negative itself. Morton, Chris. "Nuer marriage diagram" Southern Sudan Project (in development). 03 Jan. 2006. Pitt Rivers Museum. <http://southernsudan.prm.ox.ac.uk/details/1998.353.68/>.